Quantity: For thin sauce - An average of 35 pounds is needed per canner load of 7 quarts; an average of 21 pounds is needed per canner load of 9 pints. A bushel weighs 53 pounds and yields -0 to 12 quarts of sauce--an average of 5 pounds per quart. For thick sauce-An average of 46 pounds is needed per canner load of 7 quarts; an average of 28 pounds is needed per canner load of 9 pints. A bushel weighs 53 pounds and yields 7 to 9 quarts of sauce-an average of 6½ pounds per quart. 5. 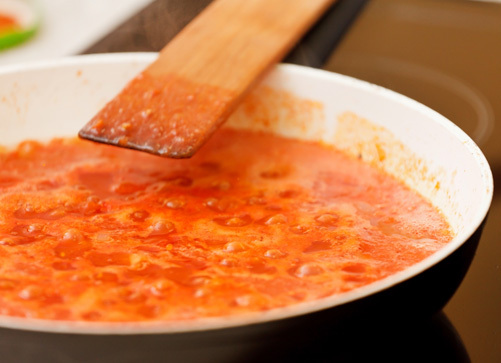 Simmer in large-diameter saucepan until sauce reaches desired consistency Boil until volume is reduced by about one-third for thin sauce, or by one-half for thick sauce. 8. Fill jars, leaving ¼-inch headspace. 9. Wipe rims with clean damp cloth, adjust lids and process in either a boiling water canner or pressure canner according to the recommendations.